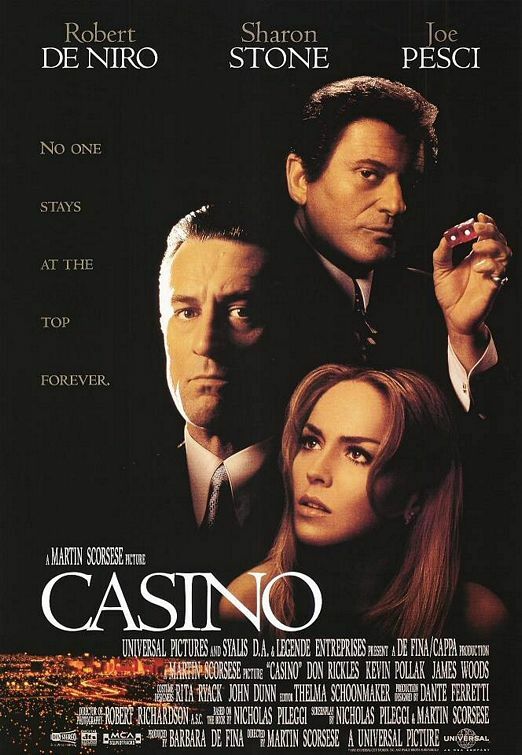 Casino is about the life of Sam Rothstein (based on real life casino boss Frank Rosenthal). Ace, as he was known by his contemporaries, was as sharp as they came; from his fashion sense to his obsessive pursuit of perfection. As the film progresses, we get introduced to Nicky (Jo Pesci) and the indubitable Ginger (Sharon Stone). Ginger controls the tone of this entire picture, bringing solace at the beginning and screwing it all up by the end. We watch as she cracks up through the film, creating one of the most disturbing rise/fall character juxtapositions you will ever see in film. In this scene we get our first taste of Ginger, a working girl that completely captures Sam Rothstein as she works a gentleman across the room. The setup to Ginger’s introduction is a brilliant visual narrative that explains the obsessive nature in which Casinos are managed and overseen. The eye in the sky is watching us all.